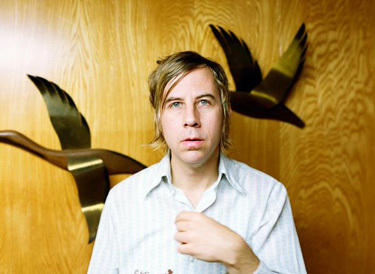 John Vanderslice has been releasing solo albums for the past decade, as well as producing albums for such bands as Spoon and the Mountain Goats. He writes clean, clever music that often tackles the dark and the political while still offering sweet melodies and a warm analog sound. His 2009 release, Emerald City, is filled with beautiful hooks and is rightfully considered Vanderslice’s best work so far. I’m a food snob. I’m not crazy about computer recordings. Music can change your brain chemistry very easily. I feel it everyday. 6, when I found my dad cheating on my mom. At first no, but now, for sure. verse in "Kookaburra": "lightening shot from the sky…" [drums and piano return to song] that part. I want to be a better friend, less guarded and isolated. Extensive travel in SE Asia: Vietnam, Cambodia, Bali, China, India. I am rabidly anti-war and anti-military. That I’ll fall into major depression again. 13. What is your favorite movie? There are a thousand of those, but I just saw Lars von Trier’s Europa, which I loved. 14. Favorite album(s) from the last few years? 15. What would you like to know more about? 16. What is one thing you would like to do/see/accomplish before you die? Live off the grid with my wife. Posted in Music, Music Interviews and tagged John Vanderslice, Random Truths. Bookmark the permalink. Trackbacks are closed, but you can post a comment.